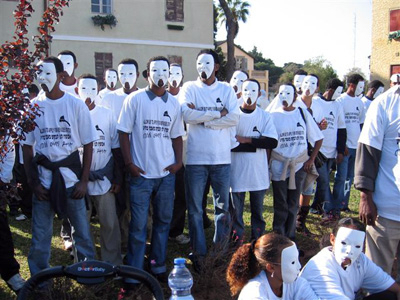 Yesterday's problem: "We're here" asserted illegal immigrants from Eritrea in protest against Israel's refusal to grant them refugee status outside the Defense Ministry in Tel Aviv in December 2008. 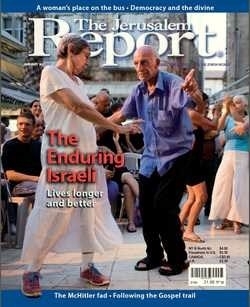 The Jerusalem Report's cover story on Israeli longevity. Longevity: "Israeli men take the title of the world's highest life expectancy. ... [they] live on average to the age of 80.2, closely followed by Switzerland with 80. In all other countries in the Western world, including Japan, men die, on average, in their 70s." (Shula Kopf, "Living Life to the Full," The Jerusalem Report, January 30, 2012) May 20, 2016 update: Four years later, the World Health Organization finds that Israel ranks seventh in the world in life expectancy, at 82.5 years, fifth highest for men (at 80.6 years) and ninth highest for women (84.3). Japan comes in first at 83.7 years, followed by Switzerland, Singapore, Australia, Spain, Iceland, and Italy; Sierra Leone comes in last, at 50. Claire Danes stars as a CIA officer in "Homeland," which is based on the Israeli series "Prisoners of War." Are Zionism's Prospects So Bleak?